This story has me intrigued. Here we are in the middle of the silly season, when the proper journalists have gone on summer holiday and all that is operating the presses is the janitor locked in the bathroom cupboard, and the DomPost comes out with a cracker of a front page article like this. This is a massive story, really, a big day for Wellington, and yet here it is when we’re all still on holiday and no one is paying attention to anything. Although the pictures supplied by Stuff just say “Centreport”, it doesn’t mention the design team. Eagle-eyed viewers will note however that there are Studio Pacific Architecture tags on the renders, although I’m picking there will be an engineer in the mix as well, and possibly even a contractor advising too. I mean – how do you even build a floating drawbridge, in the ocean, on a fault line, with the tides, and the waves, etc etc. Some tricky problems there! To be perfectly honest, I’m not even sure what I’m looking at in these pics. I presume that the white boated-looking things are in fact boats, not part of the terminal itself (Boatey McBoatFloat), but I could be wrong. The long white snake-like ramps are presumably only for foot passengers, and seem to be there to safely cross over the miles of truck lanes and car traffic that builds up here. Then we spy what looks like a nice new green waterfront park, near the current decrepit passenger terminal – and a new two-story glazed box that could perhaps be a new passenger terminal? But are they, in fact, reassessing the whole harbour layout? Clearly, from this picture, they are not. The terminal appears to be in exactly the same place, bang smack on the main Wellington fault line, complete with the same stark dangers as we have always had: that in the event of a massive Wellington quake, the ferry terminal would be out of action, perhaps for months. Certainly in the Kaikoura quake, where CentrePort land and buildings were hit very hard indeed, the ferry docking facilities were knocked out of action, apparently caused by one of the ferries taking off out to sea without disengaging the connecting ramp properly, and wrenching it off / making it fall into the sea. Did I get that right? The issue, presumably, is the rail tracks that align our one remaining rail ferry with the lines on land. Cars and trucks can just have a nice big flat sliding plate which they can drive over, but a railway bogie needs some pretty accurate track aligning and that needs a rigid connection. Difficult with the wind blowing you sideways, and the tides pushing you along, and waves making you go up and down, but when you have to allow for seismic action as well…! There’s not a lot of room to play with there either, with a 6-lane motorway flying past, and the main connection routes for the water supply, sewerage, etc through there as well. But despite all that, somehow they are managing to talk to BlueBridge and get them on board (with the idea) as well. So – who is going to be paying for this? You and me? Or them? “main connection routes for the water supply, sewerage, etc through there as well” – have you forgotten the railways below, and the cement storage yards alongside? And what’s the bet: the main gas supply, main electrical supply, main internet cable, as well? But seriously, this “plan” is pretty tame, same location, same two berths. But they have been talking about things here and on the nearby Kaiwharawhara point for the last 20 years and have done nothing – because there is no money….. Thanks Green Welly – and welcome back – and I’ll go and have a read of those. Much obliged. The usual passanger-unfriendly route march for foot passengers. Reckon they’ll join the 20th century and have moving walkways? Henry – not sure – expensive ! Hey, what do you reckon the big white building (?) is, on the other side of the railway tracks? I can’t work it out. If the part in the top left of the top picture is a passenger terminal (seems like it must be) – then what is the other building at bottom left of the lower picture? Huh ? 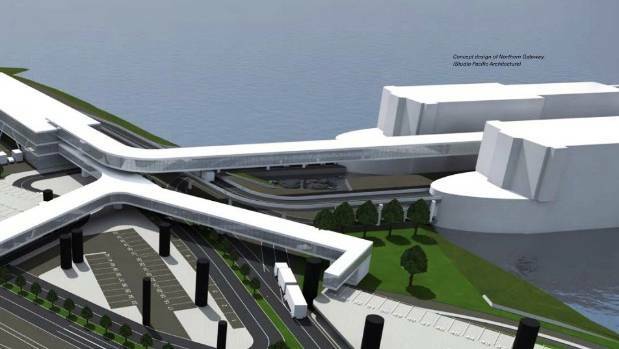 According to the NZTA document that greenwelly links to above, it’s proposed that there is a new ferry passenger terminal on Hutt Rd, so that must be the building on the landward side of the railway line – also note the proposed railway station platform. I suspect that the other building is for vehicle check in. Thanks Betterbee – had not really noticed that possible platform between the tracks. 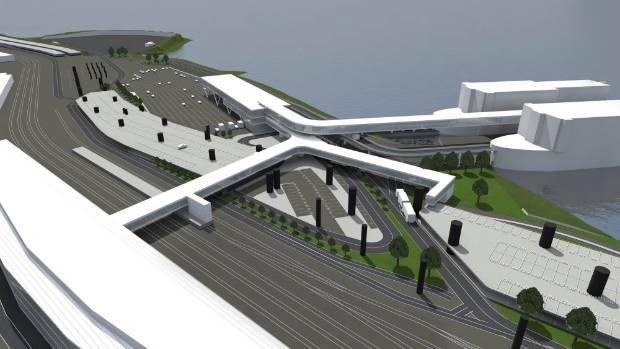 Indeed, instead of the shuttle bus at the moment that goes between Wellington Station and the Interislander, they could perhaps offer a shuttle train?